There was so much learned during this sabbatical month. It’s hard to even put into words. I’m actually still in my last week of sabbatical life so I’ll be back to share a bit more of my takeaways at some point later in the month. All I know is that some amazing things can happen when you quiet your mind and calendar and spirit to receive. I do know that I love how things work out–call it my “connectedness” strength coming into play–we received almost an entire week off of work due to a major snow-storm that had records snow-fall and low temps for our area. Talk about a blessing of a sabbatical within a sabbatical. I also had 2 sick days during this time–definitely not a blessing, but I think sometimes our bodies respond and tell us when we need attention and rest. I have definitely been cashing in on the “good sleep” equation of my February plans. Overall I would say that it is amazing what you can learn about yourself when you take a step back and quiet yourself, your calendar and even your house (definitely something I’ll be doing in the coming months). I have found some clarity on things I’ve been pondering for some time, passion fueled for things that had been simmering for some time and joy out of simple things like a spontaneous at home date night when the beau opens up the good bourbon. 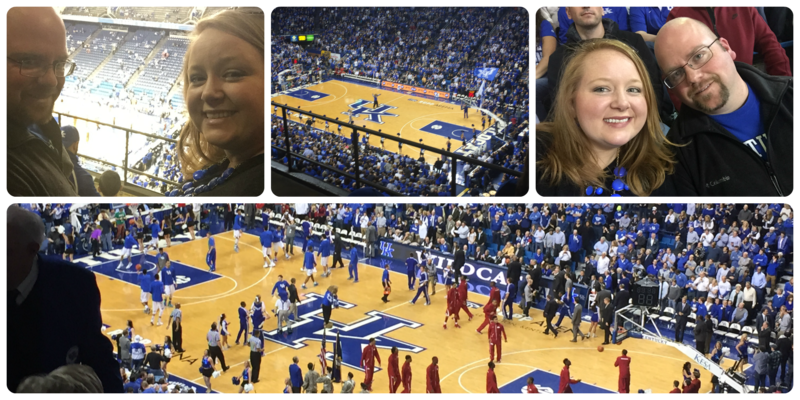 And having a clear schedule to take advantage of UK tickets that become available to you the night before a game isn’t too shabby either! GO CATS! 30-0! Let’s All Be Brave by Annie Downs–finished this in January, but still an amazing read. One I read slowly but know I want to go back and re-read. Cold Tangerines by Shauna Niequest. Love her writing style and the authenticity that bleeds through her writing. Where’d You Go Bernadette. Great fun read that I absolutely did not want to end. This Radiolab. The idea of Facebook and social science research and how we share and retrieve and communicate. So fascinating both personally and professionally. That Sounds Fun from Annie Downs. This girl makes me laugh like no other and I just LOVE the episode I linked on Nashville food. The Happy Hour with Jamie Ivey. Absolutely love hearing this gal talk with a girl friend over things that are really meaningful, fun, real topics–and sometimeshard ones. Catalyst Leader Interview with Shelley Giglio. Cannot even begin to say how powerful this was for me. I want a transcript of certain parts of this. Shelley’s interview starts at the 20 minute mark and ends around the 45 minute mark. Tiny Desk Concerts from NPR. Have loved these for a while, but really great to discover new music or see a new side of an artist. The Lone Bellow. My love for NYC meets my love for all things southern. And there’s a mandolin playing red-head. (You can combine the last two by watching the Tiny Desk Concert of The Lone Bellow). So very very sad their conert in Louisville sold out literally as I was getting ready to purchase my tickets. Same thing happened with StubHub. Guess it wasn’t meant to be! Behind the Mask–absolutely LOVE this Hulu original —“Behind the Mask” dives into the colorful, unusual side of sports through the eyes of four mascots. (description via Hulu). It’s a good heartfelt show that’s fun and has had both the beau and I in stitches and on the verge of tears. Savor –the devotional by my gal Shauna Niequist-releases March 10th and I’m super stoked. Pre-ordered and ready. “Living abundantly where you are, as you are.” Could not be more perfect for me right now. Refit Revolution Live Master class! So super pumped. This way of working out has really been sustaining to me working out while we had snow and freezing temps outside. And I can barely make it through this workout without tears. More intentional dates with the beau–we’ve come up with a list of restaurants we love and some new ones we want to try and when it’s date night out–we’ll draw from the list–excited to try this out starting this month. Clean eating and fun movement! Facebook and Twitter on my phone. Things that put ME in the spotlight. I want to serve and let Jesus be the focus. Time-Wasters. I know that if i start a Gilmore Girls episode, I’ll likely watch 3. I want to make the most of my time especially after work in the evenings. Clutter. Mental and Physical stuff that is in excess and not necessary. Self-doubt, self-judgement and self-criticism. I want to be in the ring of my own life fighting hard even if the outcome isn’t what I wanted. I don’t want to be my own critic. So what book recommendations do you have for me? And what will you be saying yes and no to? I LOVED Where’d You Go Bernadette! And love how you are still staying yes to certain things and no to others. A book suggestion- And The Mountains Echoed by the same author of The Kite Runner (cannot remember the name!) Happy continued sabbatical! Thanks Jesse! I will have to check out your book recommendation!